Come play games and have some fun as a family! 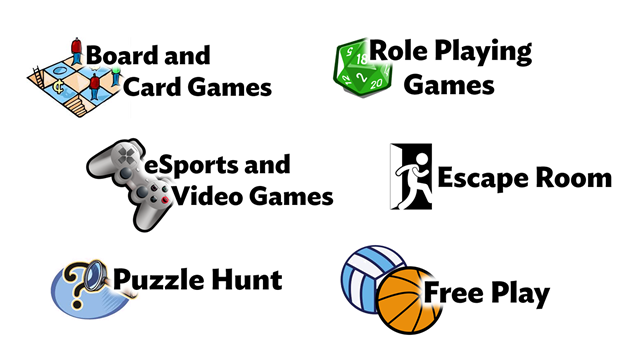 We will have a variety of forms of entertainment, including board and card games, role-playing game and eSports demos, escape rooms, and more! Food and drink will also be available for purchase in the Dining Hall. Admission to SFHS Game Night is $5 per person, with a cap of $20 per family. All proceeds from Game Night will go to fund the Media Center and the participating clubs, including Chess Club, Role Playing Games Club, and our eSports league team. As soon as we have our bigger events scheduled, we'll give you first dibs on slots to participate! Click here to sign up for text or email reminders to get advance notice! You can pay in advance on My Payments Plus, under the category SFHS Media Center. You can purchase individual and family admissions, as well as individual slots for one of the Escape Rooms.